On Thursday, Labor Guild Youth Caucus members were at the State House for the Fair Share Bill Hearing. 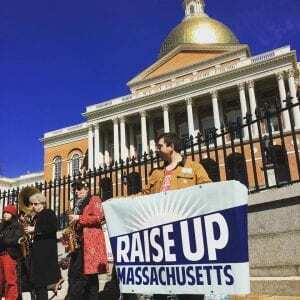 The Raise Up MA coalition successfully organized to back the public hearing as the Joint Committee on Revenue heard public testimony. The Fair Share amendment(S.16, H.86.) is a proposal to amend the state constitution to include an additional 4% tax on annual income over $1 million. Massachusetts currently has a flat-tax of 5.1%; if you make $35 thousand a year or $35 million a year, you pay the same percentage in taxes. If the bill passes, it would not immediately lead to the tax being implemented. Rather, the legislation would then be placed on the ballot and require approval from voters. The legislative route was not the first choice of the Raise Up coalition. Previously, a citizens’ initiative with identical legislation was introduced, but was ruled unconstitutional. State law requires that all items in citizens’ initiatives be “related or mutually dependent,” and the court took problem with the legislation’s dual purpose of taxing the rich and simultaneously requiring funds raised through the new tax be spent on education and transportation. Constitutional amendments introduced by the state legislature are not held to the same standard, so no legal challenges are anticipated. Multiple panels drawn from the Raise Up MA coalition gave testimony in support of the bill. Faith leaders, workers, professors, policy experts, and community members shared their perspectives on the moral and economic aspects of a millionaires tax. Perhaps the most moving were the various testimonials from public school teachers. One teacher shared how his classroom handouts were limited to just one sheet of paper per student per day. “Everyday I have to make a tough decision about what not to print,” he explained, and asked the committee members if they could imagine completing their daily work with just one sheet of paper. as an MBTA employee I see how we need more funding on a daily basis. Management, for years, has kept staffing levels at a bare minimum. Most of the T’s operating budget goes towards paying the employees that keep services running. I see more funding as a way to expand staffing levels to be able to run more dependable service and cutting down on dropped trips that causes delays for our passengers. We would be able to provide the kind of service our passengers deserve. [Management] would rather pay overtime than increase the staffing levels. The T and the public want to expand service, rightly so, but they don’t ever talk about how they’re going to fund the staff it will take for such expansion. as a young parent I see our schools not receiving any budget increases under the Baker administration, and our schools are forced to make tough decisions every year. Supplies run short and parents are often asked to contribute out of pocket while our underpaid teachers regularly contribute supplies from their own paycheck. Enough is enough! The wealthy can contribute more and still be okay. Anyone not wealthy has been stuck with wages that haven’t increased at needed levels while living expenses continue to rise at staggering rates. The business advocates at the hearing had statistics that were easily debunked and showed their true colors – pure self-preservation. That’s why you need to force them to contribute to society with legislation like this constitutional amendment. Lobbyists representing various business groups also gave testimony, attempting to convince legislators that the Fair Share legislation was not the solution to the state’s underfunded budget. Their testimony combined moral arguments and policy predictions, which are examined below. The lobbyists affirmed that “everyone has a different understanding of fairness,” and, defending the current flat-tax rate, that asking the wealthy to pay more was a violation of fairness. Of course, working people and legislators alike see this argument for what it is: self-interested whining from the mega-rich. There is nothing fair about the mega-rich and single working mothers paying the same portion of their income in state taxes, not to mention that the tax doesn’t even apply to the first $1 million in annual income. 95.5% of Massachusetts residents will not pay a cent more in income tax. What is more challenging to address are the corporate lobbyists’ “concerns” that the proposed legislation will not raise as much revenue as anticipated because millionaires will simply flee the state. While it is undeniable that some millionaires may alter decisions about moving to or remaining in Massachusetts, a study from Stanford University addresses these concerns and finds that they are grossly exaggerated. The study finds that moving locations is not so easy for millionaires whose businesses are tied to local economic conditions and relationships, and that similar taxes passed in other states did not lead to drastic millionaire flight. Furthermore, the committee also heard testimony from small business owners in support of the legislation. Many, if not most, small business owners will never be affected by the tax; but small business owners do rely only public services and healthy communities on a daily basis to maintain prosperous commerce, and those testifying in favor made it clear that their businesses would benefit from increased investments in education and transportation. Afterall, small business owners are also parents, residents, and commuters who rely on our schools, trains, busses, bridges, and roads. Finally, the corporate lobbyists claimed that they were not actually against new taxes, but rather were against taxes via constitutional amendment because such legislation would be difficult to alter in the future. But this argument was decimated when the former chair of the revenue committee testified that in his long tenure, the same interest groups who were now asking for increased dialogue on the Fair Share amendment had refused to come to the table during the chair’s tenure. Clearly the lobbyists and the mega-rich they represent oppose the legislation outright, and now that Fair Share is a real possibility they are intervening in an attempt to mitigate its impact as much as possible.